Cell contact-dependent inhibition and regulation of immune responses play an essential role in balancing the need for rapid and efficient responses to a wide variety of pathological challenges, while at the same time maintaining self-tolerance. 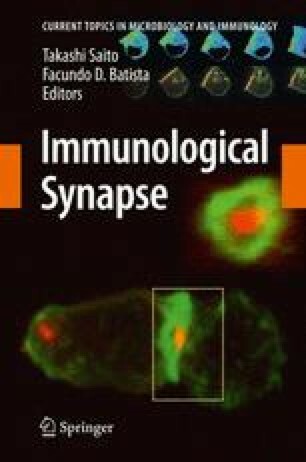 Much attention has been given to immune synapses that lead to the activation of, for example, cell-mediated cytotoxicity, and here we compare the supramolecular dynamics of synapses that lead to inhibition or regulatory functions. We focus on natural killer cells where such different synapses have been best studied. An emergent principle is that inhibition or regulatory responses are commonly achieved by selective recruitment of signalling proteins to the synapse and exclusion of membrane-proximal intracellular proteins needed for activation. We also discuss evidence that an inhibitory synapse triggers or maintains effector cells in a migratory configuration, which serves to break the synapse before the steps needed for effector cell activation can be completed. This model implies that the concept of kinetic-proofreading, previously used to describe activation of individual T-cell receptors, can also apply in determining the outcome of intercellular conjugation. We thank current members of our laboratory and F.J. Culley, M.A. Purbhoo, F.V. de Abreu, P.M.W. French, M.A.A. Neil and A.I. Magee for useful discussions. We thank N. Powell for assistance with preparing the figures. Research in our laboratory is funded by The Medical Research Council, The Biotechnology and Biological Sciences Research Council, The Wellcome Trust, a Lister Institute Research Prize and a Wolfson Royal Society Research Merit Award (to DMD).